As you probably know from my multiple reviews, I am a huge fan of tea. I love trying new kinds and when Zhena's Gypsy Tea agreed to send me some of their teas, I was very excited. The company sells many different kinds and they chose two to send to me. They did a great job choosing and sent two kinds that I would have chosen myself! For review, I was sent the coconut chai black tea and the Egyptian mint green tea. These teas are both delicious. They are very good hot and cold (yes, I tried both of them both ways in about 3 days). 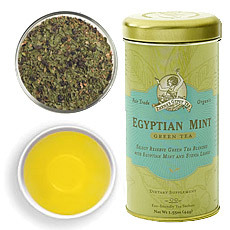 The Egyptian mint is not too minty but has a very fresh taste. 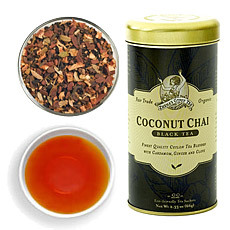 The coconut chai is very tasty and is good with or without milk or sweetener added. It was also featured in Shape magazine. Now let me tell you a little more about the company. Zhena's Gypsy Tea sells fair trade organic tea. The tea seems to be very high quality and comes loose or in sachets. They sell black, white, herbal, green, and chai teas. It is also reasonably priced. A tin of the coconut chai costs $6.99 for 22 sachets. I love both of these teas so much that I can't wait to try the rest of the delicious flavors!